MEGABOOK M4 is Finally HERE! | CE Publishing Group! Supersite! MEGABOOK M4 is Finally HERE! We are pleased to announce that MEGABOOK M4 is finally here! You can find this incredible book on the stands at DriveThru Comics! Where you can find all of the amazing titles from CE Publishing Group! Most of our titles are completely FREE and over 2,000 pages to download! Within the pages of MEGABOOK M4 there are 51 amazing stories inside of this great 294 page book all put together by 82 independent comic book creators! We all hope that you enjoy this amazing FREE book! If you’d like to learn more about the creators of this edition of MEGABOOK, please stop by our great friends at Blackship Books to read interviews about our stable of wacky genius’. MEGABOOK’s very own superstar Marcus ET has prepared interviews with all of our M4 creators. Many new faces and also old who have been with us since the beginning as Marcus has. namely Orlando Baez who pencilled all of our chapter pages, Paul Knipfer for our cover concept pencils and the amazing graphics of Joya Rickaby that knit all of our 294 pages together so nicely (yeah Mike did some stuff too). Of course our BIGGEST THANKS goes to all of the 82 comic creators that make this publication truly amazing! You all are the heart of the indie comic book world that keeps the pulse of the MEGABOOK Frankenstein monster flowing and Fiercly INDIE! GREAT NEWS! 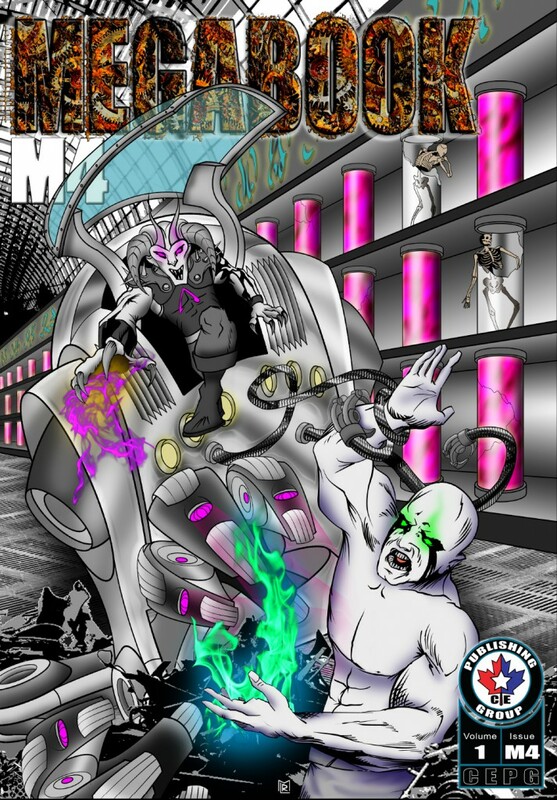 MEGABOOK M4 will be CE Publishing’s first Trade Paperback offered in hard copy! Please stay tuned for how and where you can obtain a copy! Last but not least…. Here is the incredible cover for the new MEGABOOK M4! Click on this cover or the DriveThru Link above to obtain your Free digital copy! If you are so inclined, you can also use the “pay if you want” option to help keep these books coming your way!